The mass killings, which began in 1915, have long been a topic of controversy between Turkey and Armenia. To Armenians, the slaughter is a seminal event in their shared history, and members of the community, including Kim Kardashian, are doing their best to draw attention to the estimated 1.5 million lives lost. Turkey acknowledges that atrocities took place, although it maintains that the death toll was closer to 300,000 and rejects the term genocide entirely. By definition, the term genocide means a premeditated and systematic attempt to eradicate an ethnic, racial or religious group of people. Turkey argues that the deaths were an unfortunate part of a complicated war in which many Turkish lives were also lost. But how did this violence come about? The historic Kingdom of Armenia was the first nation to declare Christianity as its official religion. In the 15th century, it was progressively absorbed into the Muslim-ruled Ottoman Empire. Even though Armenians were granted few political or legal rights, they were allowed a degree of autonomy. Maintaining their religious and social identity, the Armenians thrived for centuries. But by the early 20th century, the once formidable Ottoman Empire was crumbling. In 1908, a reform movement, the Young Turks, seized power. The Young Turks set out to modernize and nationalize — or “Turkify” — the empire. The Ottoman Empire lost a vast amount of territory in the Balkan Wars of 1912-13. In 1914, the Turks entered the fray of World War I on the side of Germany, wary of any challengers to what was left of their empire. The Young Turks feared that the Armenians would side with the Ottomans’ Christian neighbor and principal enemy, Russia. Turkish propaganda started portraying Armenians as a threat to the empire. It was on April 24, 1915, that hundreds of Armenian intellectuals and community leaders were arrested and later executed. This began what most historians have named the Armenian genocide, which lasted for several years. 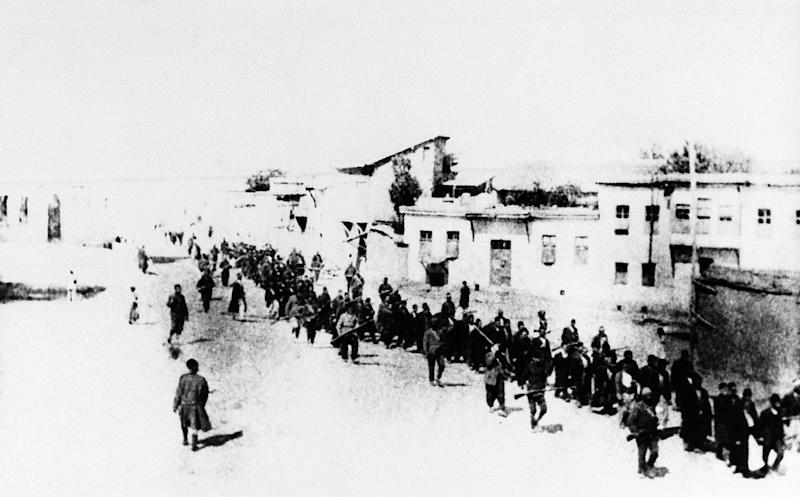 Armenians, including women and children, were rounded up and killed or sent on death marches across the Syrian desert, where they died of starvation or disease. In 1918, the Ottoman Empire surrendered, and the Young Turks’ leaders fled. In 1923, the nation started anew as the Republic of Turkey, with an eye towards the future, rather than focusing on the past. One hundred years later, Turkey is still dismissing calls to recognize the atrocities as genocide. The United Nations’ Subcommission on Prevention of Discrimination and Protection of Minorities, as well as the European Parliament, have called for Turkey to “come to terms with its past.” According to a recent poll by the Center for Economics and Foreign Policy Studies, based in Istanbul, only 9 percent of Turks believe the government should acknowledge this as a genocide. More than 20 countries, including Argentina, Belgium, Canada, Austria, and Russia, disagree and consider the killings to be a genocide. Germany, Turkey’s ally in World War I, reportedly plans on the anniversary this Friday to vote on declaring the killings a genocide. Absent from that list is the United States. President Barack Obama, however, did refer to the Armenian genocide when he was a senator and during his first presidential campaign, but not since. Turkey is an important ally and the U.S. government is hesitant to say anything that would damage relations between them. After Pope Francis and Austria officially acknowledged the genocide, Turkey recalled its ambassadors from both Vatican City and Vienna. As the centennial anniversary arrives, and as the Armenian people continue to fight for the day when their darkest chapter will be recognized by Turkey and the rest of the world, they will not forget those who were lost. Correction: In a previous version of this article, it was stated that no sitting U.S. president had said the word "genocide" in reference to Armenia. President Ronald Reagan referred to the "genocide of the Armenians" in his April 1981 Holocaust Remembrance Proclamation.